Back in the golden days of GPS devices, before the time of smartphones and Waze, there were a lot of GPS manufacturers. Mio was one of them. Mio made a line of lower priced GPS devices and sold them all over the world, including North America and Europe. I don’t think they are sold in the US any longer, and I know it’s almost impossible to find any mounts. This article is written for those that have a Mio GPS, and it’s working fine for them, but the mount doesn’t work any longer. Mio made a variety of GPS devices. Most had a 3.5″ or 4.3″ diagonal screen size. A few that were offered during the latter years had a 5.0″ diagonal screen. These GPS units were sold under the names of Mio Moov and some of the very early models had the letter “C” followed by three numbers such as C220. Most of the Mio GPS devices followed a cradle and mount design which is somewhat similar to what you see with the Garmin Nuvi and Drive series. So we have a GPS with a custom cradle and it can be removed from the suction mount. 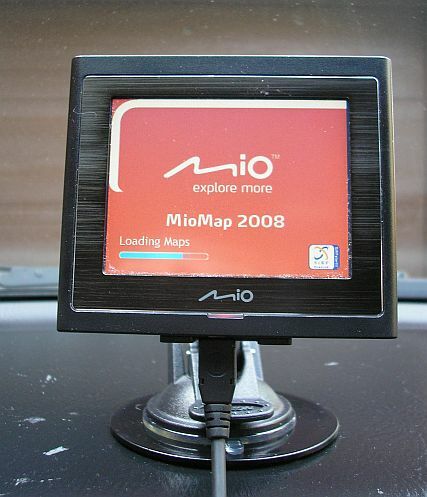 The photo accompanying this article is of a Mio Moov on a suction cup mounted to an adhesive dash disk. For those that still have the cradle and it’s working well, and it’s one of those older cradles that have the 4 prongs on the mount can consider the iGrip / Herbert Richter (HR) Extender Suction Mount . It has those 4 hooks that slide into the notches on the back of the Mio cradle. Not all Mio cradles have those four notches as they switched the cradles around near the end, so be sure to check. If the cradle broke, or you just want to replace the entire mount, there are a variety of alternatives that will likely work better than the suction mount you received in the box with the Mio GPS. They will work better because technology improves over time. That includes mounting technology. Suction cups are made of different materials and if you purchase a good suction cup mount, you will likely find it adheres better than the one you replaced. The new mount is going to use a universal cradle that opens wide enough for the GPS and deep enough for the depth of the device. The trick is in the depth so not just any universal phone mount is going to work here. Measure your older Mio GPS. Take measurements of the height, width and depth. A lot of the 3.5″ diagonal screen units can use a standard cell phone mount. An excellent suction cup selection is Arkon’s Megagrip Travel Mount. This mount features an expandable cradle which expands to 3.4 inches by pressing the button at the lower left corner of the cradle. This will fit your phone with or without a thick case. The mount comes with an adhesive dash plate so that you can attach to the mount to your dash as well as your windshield. The cradle is going to fit around the shorter sides so the arms will support your Mio from the top and bottom in landscape mode. We have a lot of experience with this one and it is an extremely reliable mount. The 4.3 inch and 5 inch diagonal screen Mio devices likely need something larger than a standard phone mount. Fortunately, as a result of large mega smartphones like the Apple iPhone 6s Plus, there are cradles that open even wider than standard smartphones. I have experienced excellent results with the RAM X-Grip line of mounts. The RAM X-Grip IV will fit most 4.3″ and 5.0″ diagonal screen devices. The RAM Mounts Twist Lock Suction Cup Mount with X-Grip IV Holder couples the X-Grip holder with a good quality suction cup. The cradle opens to 4.5″ which is wide enough for these devices. The included suction mount has a twist lock vacuum which is going to give a good secure hold on your windshield. The mount has a lifetime warranty from the manufacturer. These mounts should extend the life of your Mio GPS. You don’t need to buy a brand new GPS just because your mount is broke.